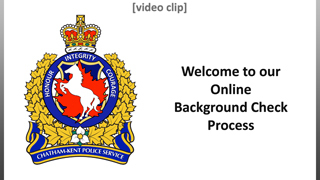 Welcome to the Chatham-Kent Police Service's new online process for persons needing a police screening check for volunteer, student or employment purposes. This system allows you to apply for a police screening check 24 hours a day without having to attend our facility. All aspects of the process - including verification of your identification, and fee payment - are handled electronically. If there are no concerns or follow-up required, you will receive an email with instructions on how to download your police screening documents. Blenheim, Bothwell, Chatham, Clachlan, Coatsworth, Dover Centre, Dresden, Erie Beach, Erieau, Grande Pointe, Highgate, Kent Bridge, Merlin, Mitchells Bay, Morpeth, North Buxton, Pain Court, Ridgetown, Shrewsbury, South Buxton, Thamesville, Tilbury, Tupperville, Wallaceburg and Wheatley. Residents of Moraviantown and Walpole Island must attend their local OPP Detachment to obtain their record checks. YOUTH RECORDS: In accordance with Reg. 349/18 2 (2) of the Police Criminal Records Act the YCJA (Youth Criminal Justice Act) restricts individuals from sharing records made under the Act. This section is applicable to ALL individuals between the ages of 12-22 regardless of search results. The Youth Criminal Justice Act (YCJA) protects the privacy of young persons who are accused or found guilty of a crime by keeping their identity and other personal information confidential. The protection of privacy is achieved by prohibiting the publication of information that would identify a young person’s involvement in the criminal justice system and by restricting access to their youth records. Making a false statement - such as a non-resident declaring a local address at which they do not currently reside - will result in the discontinuation of application processing and the forfeiture of all monies paid. Persons requiring records checks for the purposes of Adoption (through court order) cannot use this online screening process. You must attend the Chatham-Kent Police Service Headquarters in person to make application. The Chatham-Kent Police Service Headquarters is located at 24 Third Street, Chatham. If the above is the reason for your police check, you must attend our office between 8:30am and 3:30pm Monday thru Friday. The Records Management Section of the Chatham-Kent Police Service is closed on civic and statutory holidays. A police record check is current as of the date it is completed. It is your employer/prospective employer or organization's function to determine if the record check is current enough to be accepted for the position applied for. The Chatham-Kent Police Services Board, its officers, agents and employees, shall have no responsibility or obligation to make such a determination. The Chatham-Kent Police Service will notify only the applicant when their record has been completed and provide instructions to securely download it.